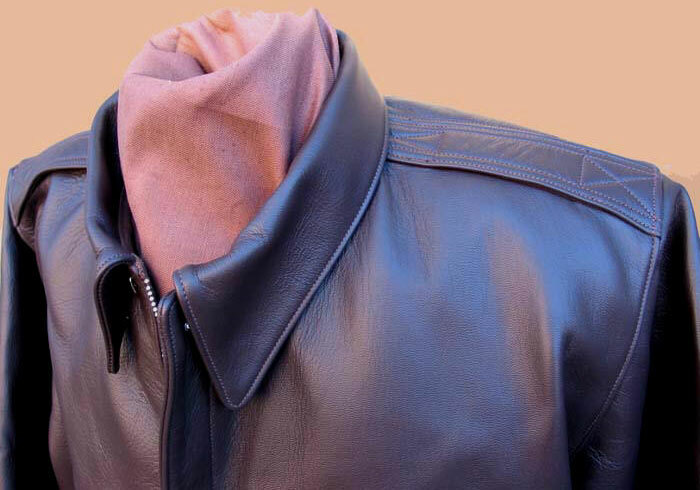 A-2 goatskin leather flight pilot aviator jacket J.A. Dubow fg. Co. The perfect WWII A-2 Flight Jacket in Goatskin. During WWII the Type A-2 Flight Jacket was made in chrome-tanned, drum-dyed HORSEHIDE and GOATSKIN (only). 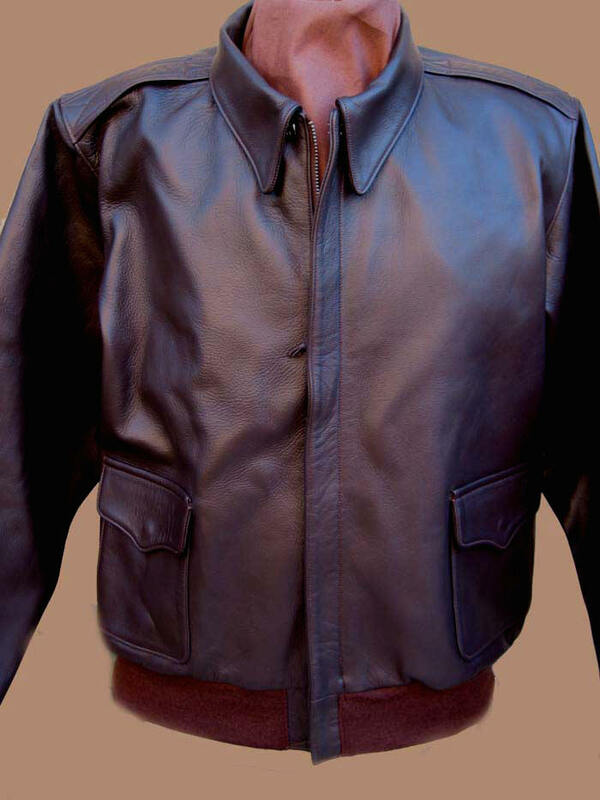 Most were Horsehide, but if Horsehide was unavailable contractors could and did make many in Goatskin. In fact Goatskin examples appear from the beginning, in the 1930s. In a prewar 1941 flight magazine Aero Leather -- which would become the biggest WWII A-2 contractor -- advertised genuine surplus government Goatskin A-2s for $10.00. (We've tried to place a large order but our mail keeps getting returned!) Presumably every one of the 20 or more AAF A-2 contractors produced some in Goatskin (to date we haven't yet seen one by Werber Sportswear -- but Werbers are scarcer to begin with). As with Horsehide, Goatskin A-2s came in different shades of Russet, Chestnut and Seal Brown depending on the contractor and what hides were available. (Contract Nos. had nothing to do with color.) To satisfy customers who prefer a darker jacket, we make ours in Seal Brown (note above shots, this is not a blackish or ultra-dark Brown). Goatskin is as strong as Horsehide but initially far, far suppler, with a super-fine, muted pebble-like grain. 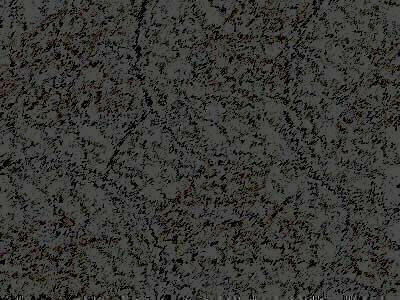 Our Goatskin is famed for its weight, granular consistency, rich deep color and hand. It needs no break-in; put it on, it's buttery, but thick and strong. Peerless hide. We have nearly as many enthusiasts for our Goatskin as our Horsehide. Examine the shots above: the heft and grain of the hides; the detailing; the shaping. The drama. It's all there, but it's so much more once a customer gets to wear it. We pay a lot more for our Goatskin than others, but the bottom line is -- we have to, because for LOST WORLDS quality and specification are what are important. Wear it in the drenching rain to appreciate its natural water repellency, coupled with our unique 196/90 Type VI military Oxford Tobacco Brown Cotton lining with waterproof finish. Our hides thrive on and in bad weather. Made of course in our own New York factory to artisan levels of quality, fit and proportion. "On 10/17/13 I received my A2 in Goatskin. 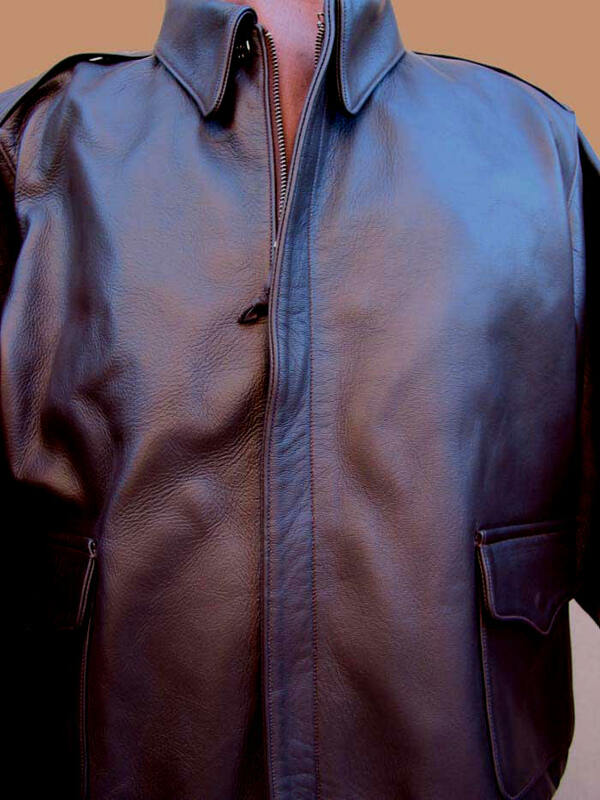 The jacket is absolutely stunning and the quality is like no other clothing item I've seen with the exception of the A2 in Horsehide I purchased from you last year."